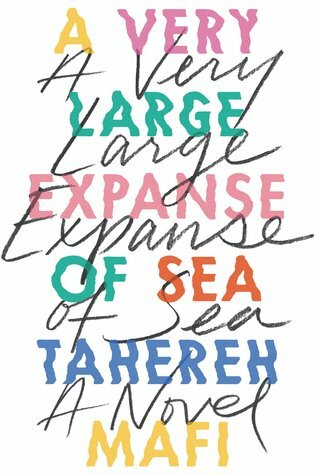 I have enjoyed Tahereh Mafi’s writing for quite some time now and was intrigued to find out that she was releasing a contemporary book. She usually writes in the dystopian genre. I was definitely interested to see how A Very Large Expanse Of Sea would compare to her other books. I thought it was a fantastic read on a very important subject. The story is set in 2002, a year after 9/11. Shirin, is a Muslim-American girl who is dealing with the fall out and racism after 9/11. Shirin wears a hijab which causes her to become a target for bullying and racist comments within school and the local community. Shirin has started to become hardened to the way she is treated. She doesn’t come across as a very nice person anymore because her guard is up. She’s desperate to protect herself. When Ocean comes along, he wants to get to know her. Shirin has to learn how to let her guard down and let someone become closer to her. The relationship between Shirin and Ocean is both sweet and frustrating. I think that’s pretty relatable though for the age of the characters. Sometimes I just wanted to push them together, but I think their struggles and stubborn behaviour were totally spot on. Having a relationship for Shirin, would have been a challenge, especially post 9/11. I loved Shirin as a character. She’s so fierce and not afraid to speak her mind despite what the community is doing to her. This story does heavily involve romance, but it’s also more than that. Tahereh Mafi takes you into Shirin’s world. We find out how terrible people can be towards Muslims, especially those wearing a hijab. It was interesting (although horrible) to read about Shirin’s experiences with racism, but it was also lovely to read about the people that really cared about Shirin. I think there was a good balance. It mean it’s not all doom and gloom. I feel like Tahereh Mafi somewhat educated readers about some aspects of Muslim culture. Of course, not all Muslims are the same, but it did give you an insight into some of their lives without being condescending. I appreciated that. I loved how we learnt about Shirin’s family. Her mum and dad were immigrants and aren’t sympathetic towards her drama at school. You can understand when you read about their experiences, however, they do still care about their daughter. That’s clear. A very touching read. It was lovely to read a contemporary story from Tahereh Mafi. Especially a topic in which she has so much personal experience with! 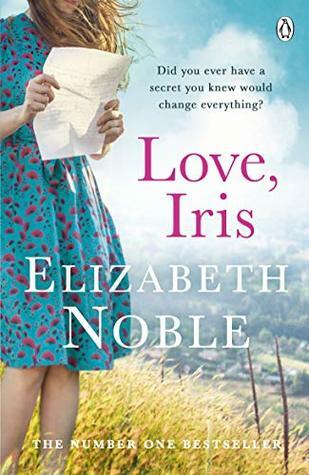 Talking About ‘Love, Iris’ with Bibliobeth! Tess has a secret – one which is going to turn her life upside down in just nine months’ time. The only person she can confide in is her beloved grandmother. But Iris is slipping further away each day. Then chance brings a stranger into Tess’s life. Gigi’s heart goes out to Tess, knowing what it’s like to feel alone. She’s determined to show her that there’s a silver lining to every cloud. As their unlikely friendship blossoms, Tess feels inspired to open up. But something still holds her back – until she discovers Iris has a secret of her own. A suitcase of letters from another time, the missing pieces of a life she never shared. Could the letters hold the answers that Tess thought lost for ever? CHRISSI: I knew you would initially be unsure of reading this book. What was it that made you unsure? BETH: Ah, you know me too well. I’m afraid to say that one again it was the cover that was initially a turn off for me. I have to be compelled to pick up a book and a beautiful cover can be the magic moment where I’ll pick it up and want to read the blurb on the back. I’m afraid with Love, Iris, if I ordinarily saw it in a bookshop, I wouldn’t even pick it up to read the back. I would (wrongly) assume that it wasn’t going to be the book for me. I’m glad that reading books with you as part of our “Talking About” series is making me pick up books that I wouldn’t normally and being pleasantly surprised as a result! BETH: Interspersed amongst the story are Tess’ letters to her developing baby. Did you enjoy these and what do you think they added to the narrative? CHRISSI: Great question! I did enjoy the letters to her developing baby. I think they made Tess really relatable especially to prospective mothers. You could sense Tess’ insecurities about motherhood but also her growing bond with her developing baby. I thought that was really sweet. CHRISSI: Discuss the novel’s varying depictions of marriage. What kinds of relationships seem most likely to fail or succeed? Ultimately, do you think marriage is seen as a positive or negative in the story? BETH: Such an interesting question. Okay, so we have various relationships in the book – we have the older generation of Iris and her husband who were very happily married compared to Gigi and Richard who have been married for years and have three grown children together but recently Gigi has been feeling unhappy and taken for granted and decides a period of separation would be a good idea. Then there is Iris’ grand-daughter Tess who is pregnant but not in a relationship and her mother Donna who has raised her as a single parent. I don’t think you can ever predict what relationships will fail or succeed to be honest and I also don’t think marriage is the be all and end all. As Gigi has shown, you can be married for years and then realise you’re not happy and personally, I supported her decision to bail out if she wasn’t content. You never know what’s going to happen in the future and how your relationship with your partner will evolve (or not evolve which is sometimes the problem!) On a personal level, I’ve been with my partner since 2002, we aren’t married and have no plans to do so and we are perfectly happy. I don’t think marriage is always necessary to ensure a successful relationship. BETH: Tess has quite a difficult relationship with her mother, Donna. How do you think this developed as the story continued? CHRISSI: She really did have a difficult relationship with her mother. I think it developed into a sort of understanding throughout the story. As Tess began to lose Iris, and become a mother herself, I believe it made her want to sort things out with her own mother. I think losing a close friend or family member gives you perspective and makes you want to sort out issues that could be in relationships. I don’t think Tess and her mother will be the closest, but I think their experiences brought them together. CHRISSI: Did you have a favourite character? If so, who and why? BETH: I can’t choose! I have so many favourite characters in this novel. I loved our main female leads – Tess, Gigi and to a certain extent, Iris (although I would have loved to know even MORE about her life). I felt that as characters they were all personable, easy to like and I found myself rooting for their happiness from the very start of the story. BETH: What effect does keeping secrets have on each of the characters? What about when they reveal these secrets? CHRISSI: I feel like both Tess and Gigi’s secret was better for them when it came to light. Tess was hiding her pregnancy and although her boyfriend was a bit of a turd about the pregnancy, her life was definitely on the up after the secret was revealed. Gigi wasn’t happy in her marriage. I think she had kept it secret for so long to keep up the happy family vibe with her children that she clearly adored. Even though it was tough for her to leave her marriage and upset her children, it was the best thing for her. No one wants to stay in a relationship like that. Life may have been a little messy for Gigi, but the future could be brighter. Iris… oh I loved that character. She kept so many secrets about her brother Tom from her family. I wish we could have known more from Iris. Secrets was definitely a common theme in this story but mainly love, family and self-discovery. CHRISSI: Discuss whether you agree with Wilf’s entreaty to Iris that ‘love is the simplest thing in the world.’ How do the relationships in the novel support or contradict this statement? BETH: Wow. Tough. It is and it isn’t is my answer! I think it can be very easy to fall in love with someone – after all, it doesn’t take much effort and is one of the most wonderful feelings in the world. However, I think staying in love with someone can be very difficult, both of the individuals have to make a concerted effort with each other otherwise they can end up in a stagnant place where they take each other for granted, much like Gigi and Richard find themselves. Also, being in love with someone where the feelings aren’t reciprocated as strongly can be quite dangerous because you open up your heart enormously and leave yourself vulnerable to becoming very hurt. 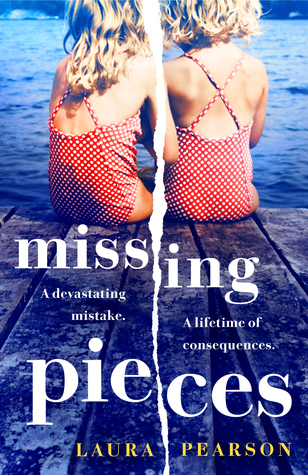 I had heard fabulous things Missing Pieces so I was super excited to read it in-between my commitments with my blogger sister, Bibliobeth this month. It’s a short book at under 300 pages, but each moment was jam packed, yet it never felt too much. I am so impressed that this book is Laura Pearson’s debut, I think she is a very promising writer! Missing Pieces is a story about a family that used to be super happy, until the loss of their youngest child. It only took a short time for the tragedy to occur. An elderly neighbour needed help, so the two children were left alone for a short time. In that time, the youngest child died and Sadler’s families lives turned absolutely upside down. Understandably, the guilt and the grief affects everyone in different ways. Linda blames her daughter for not looking after her sister properly. Linda’s youngest daughter Phoebe, was clearly her favourite. She can’t look at her husband as he should have been home. With the discovery that Linda is pregnant, she really doesn’t want another child. She wants Phoebe back. Terrible events occur which I don’t want to spoil. It’s one you really don’t want to know about before reading the book, but trust me it is highly emotional. The second part of the story is centred around when the new baby is grown up. She’s named Bea and is pregnant herself. Bea wants to know exactly what happened to the sister she never knew. What is being kept from her? I really did think this was an incredible story. It was emotional, but wonderful at the same time. It centres around how it can take a long time for you to forgive yourself and for some they never can. It’s about love, forgiveness, family and learning to move on despite events in the past. I thought this was a fantastic debut novel. I look forward to what Laura Pearson writes next! I borrowed it from Beth! This is not a great love story. This is a story about great love. On a morning that seems just like any other, Robbie wakes in his bed, his wife Emily asleep beside him, as always. He rises and dresses, makes his coffee, feeds his dogs, just as he usually does. But then he leaves Emily a letter and does something that will break her heart. As the years go back all the way to 1962, Robbie’s actions become clearer as we discover the story of a couple with a terrible secret – one they will do absolutely anything to protect. Beth absolutely loved this book which she demanded that I read as soon as I could. So I bumped it up my TBR and got to reading it near enough straight away! I really enjoyed this book which was such a lovely romance with a hint of a secrecy that kept me turning the pages. 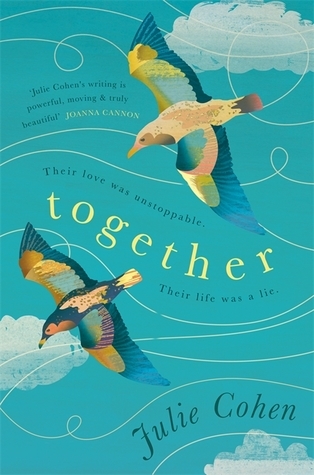 Together is a love story between Robbie and Emily. At the beginning of the book, we find out about their relationship at an older age. They’re struggling with some health issues. From then, we learn about their relationship in reverse. I loved reading about their relationship in this way. The reader gets to know about the ups and downs in their relationship and you really feel like you know them. I loved how a secret was teased from the start. I knew it was going to be a big one that could destroy their relationship. I was intrigued and it kept me turning the pages. I won’t reveal anything about the secret, but it’s something that I didn’t see coming. I love it when an author surprised me and Julie Cohen definitely does that. I just had to keep reading to find out what on earth was going to happen. I’m happy to say that I hadn’t predicted what was going to happen. I had some ideas about what it could be but I was by far wrong. I enjoy Julie Cohen’s writing. I found Dear Thing to be a touching read and this book was too. Julie’s writing is absolutely beautiful and her characters are so well developed. I would definitely read more from her in the future! A lovely read! Worth checking out if you’re into contemporary reads! I received it from my Mr B’s Reading Year subscription! The story of your life never starts at the beginning. Don’t they teach you anything at school? So says 104-year-old Ona to the 11-year-old boy who’s been sent to help her out every Saturday morning. As he refills the bird feeders and tidies the garden shed, Ona tells him about her long life, from first love to second chances. Soon she’s confessing secrets she has kept hidden for decades. One Saturday, he doesn’t show up. Ona starts to think he’s not so special after all, but then his father Quinn arrives on her doorstep, determined to finish his son’s good deed. The boy’s mother is not so far behind. Ona is set to discover that even at her age the world can surprise you, and that sometimes sharing a loss is the only way to find yourself again. I hadn’t heard of this book (somehow, I have no idea how!) before it was sent to me as part of my reading year birthday present from my Mum and sister. I’m glad I got the chance to read it though. It’s not one that will particularly stand out for me, but it was a decent read and I’m pleased I read it. 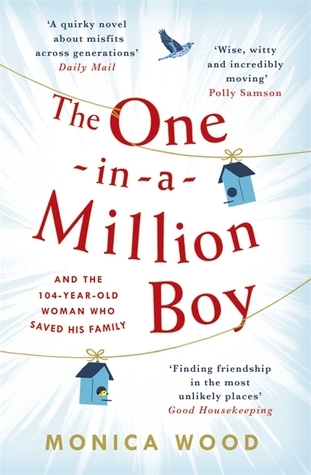 The One-in-a-Million Boy centres around a boy scout who was assigned to help an older lady. The older lady in question is 104 year old Ona Vitkus. Ona has rejected so many boy scouts as not good enough but she almost immediately connecting with ‘the boy’. He’s different compared to others his age. Ona and ‘the boy’ start to get to know each other through tea and biscuits. ‘The boy’ asks if he can ask her some questions and Ona starts to reveal more about her life. ‘The boy’ is obsessed with the Guinness Book Of Records. They discuss things that can get you into the book and hatch a plan to get Ona into the book. This gives Ona a new lease of life. One day, ‘the boy’ doesn’t turn up at work and Ona feels let down, like she was with the other boy scouts. However, his father Quinn turns up in his place and continues his son’s chores. I loved how this book had so many things going on, but at the same time it didn’t feel rushed or overly crammed with information. It’s about family. It’s about a woman’s incredibly long life. There’s sadness, but there’s hope as well. It really is a mixed bag. It has some absolutely fantastic characters who you immediately take to and want things to turn out for them all. I enjoyed Monica Wood’s writing style. I found this book incredibly easy to read and appreciated the different formats and points of view involved. When Eddie Reeves’s father commits suicide her life is consumed by the nagging question of why? Why when he was a legendary photographer and a brilliant teacher? Why when he seemed to find inspiration in everything he saw? And, most important, why when he had a daughter who loved him more than anyone else in the world? When she meets Culler Evans, a former student of her father’s and a photographer himself, an instant and dangerous attraction begins. Culler seems to know more about her father than she does and could possibly hold the key to the mystery surrounding his death. But Eddie’s vulnerability has weakened her and Culler Evans is getting too close. Her need for the truth keeps her hanging on…but are some questions better left unanswered? I have recently discovered Courtney Summers and I ADORE her writing. I love that she’s not afraid to write about tough subjects. She does so in such a raw way which I really appreciate. She doesn’t shy away from tough subjects which makes her writing so compelling to read. 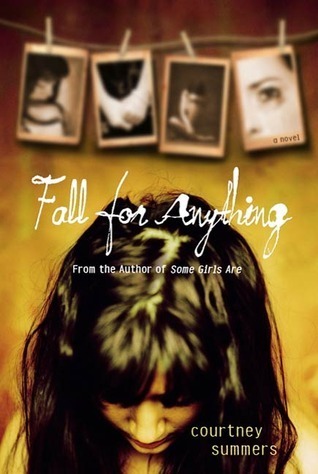 Fall For Anything centres around Eddie Reeves, whose father has committed suicide. Immediately you know that the story isn’t going to be all sweetness and light. It’s tough. It’s hard to read about Eddie’s grief, as expected, Courtney doesn’t shy away from writing about struggles after a bereavement, especially one as painful as suicide. It was so tough to read, but so important at the same time. She really portrayed the family left behind, completely broken. Eddie tries to piece some of the information left about her father in order to understand why he killed himself. It really is a rollercoaster of emotion, that the reader gets to experience through Eddie. I really enjoyed that romance wasn’t a huge element of this story. Eddie needs time to grieve. Whilst trying to piece everything together, Eddie pushes those close to her away as her main goal is to find out why her father felt he had to do what he did. I don’t want to say too much because otherwise I’ll spoil the reading experience. Courtney Summers is an author that really stands out for me as an author that’s not afraid to write honestly. I can never put one of her books down, no matter how hard it is for me to read. I appreciate that and highly respect it! Whilst this isn’t my favourite book from Courtney Summers, I still raced through it eager to find out what was going to happen! I have had Behind The Scenes on my radar for what seems like ages, so I was pleased to finally get around to picking it up on my week break from my job. It was engaging and fun to read. It centres around Ally who has a famous teen actress as a best friend. Ally doesn’t have it easy. Her father’s medical bills are threatening her dream to go to Columbia to study. Ally and her friend Van come up with a plan to solve the issue which would involve Ally being Van’s on-set assistant. Ally has a great time being an assistant, she gets to earn good money and spend some time with Van whilst Van films. She also finds herself falling for Liam, Van’s stunning co-star. However, Van’s publicist decides that Van and Liam should ‘date’ for the tabloids which begins to cause all sorts of problems for Liam and Ally. 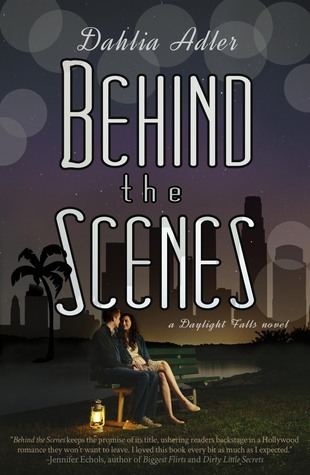 Behind The Scenes is such a readable love story. It being centred in Hollywood means there’s so much drama to read about. It’s great to try and imagine what happens in Hollywood. We all know that it isn’t exactly what it seems. I loved reading about how contrived relationships can be in the media. I’m pretty sure that it happens much more than we might think. What I loved about Behind The Scenes was the story of friendship amongst the romance. Ally and Van’s friendship was real and survived the test of time (and Hollywood) even though they were so different. The romance is completely adorable too. Liam is such a fantastic character. I really believed in the relationship. Dahlia Adler’s writing style is so easy to read. I found it really comforting to read. I lapped up the story, completely engrossed in the plot. I shall definitely be reading more from Dahlia in the future if this book is anything to go by! A wonderful piece of YA contemporary! Worth reading!